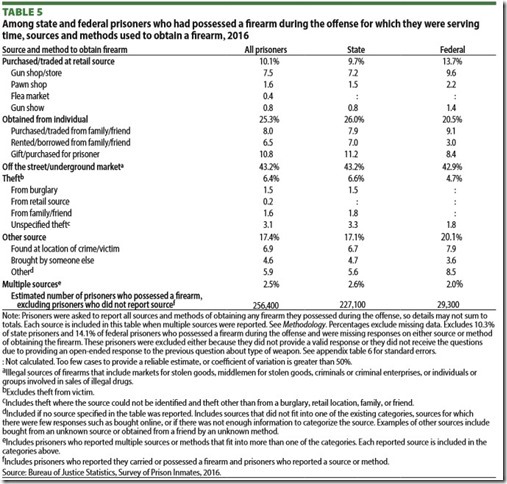 An estimated 287,400 prisoners had possessed a firearm during their offense. Among these, more than half (56%) had either stolen it (6%), found it at the scene of the crime (7%), or obtained it of the street or from the underground market (43%). Most of the remainder (25%) had obtained it from a family member or friend, or as a gift. Seven percent had purchased it under their own name from a licensed firearm dealer. [Using the percentages from Table 5, they add up to more than 100% (about 102%). 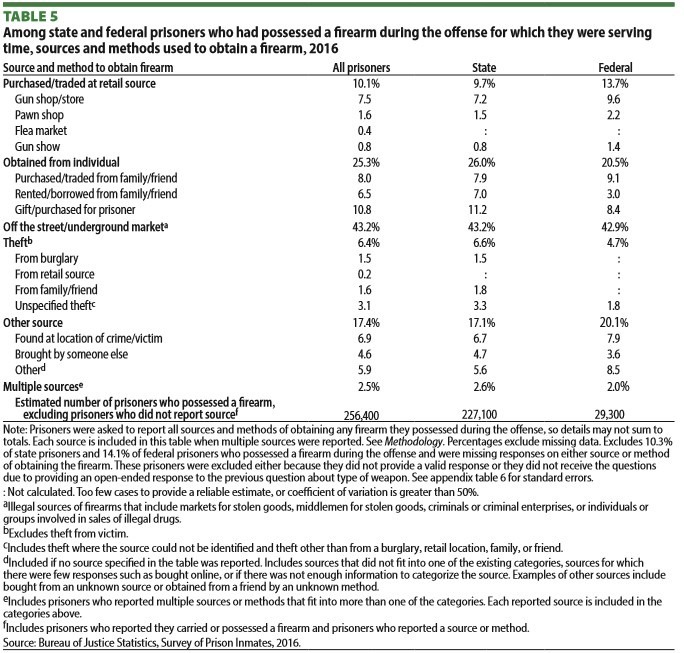 I could find where this was explicitly stated but it seems this is because some prisoners (about 2.5%) obtained guns from multiple sources. Also note that it is possible, likely even, that those who obtained them from a gun store, gun show, or pawn shop were not prohibited persons when they purchased them. What would “Universal background checks” accomplish? At most, this would affect 25% (obtained from an individual) of the transfers. But how many of those transfers occurred before the person became a prohibited person? And if they are a prohibited person obtaining them from a friend or family is already against the law! Making it doubly illegal is nothing more than nonsensical. And even if those transfers were completely stopped how many of those same criminals would then obtain their gun from different source such as the underground market or theft? That is not the intent and these advocates are evil. If they believe that they can really really ban gun why are they banning things like murder, armed robbery,assault with a deadly weapon instead? The point isn’t to do anything about crime, it is to hassle deplorables. I believe it is #1 AND #2 AND #3 for the possibilities. I refuse to be charitable anymore. The data is too compelling to be any thing else. To the brain donors that supply the political power for the leftist gun grabbers facts are neither relevant nor even comprehendible. For those in power on the left the results of this study are NOT NEW and NOT NEWS. The gun grabbers KNOW that gun laws have zero effect on the ability of criminals to obtain guns. The ugly reality is THEY DON’T CARE. Gun laws are not and were never intended to keep guns away from criminals. The ENTIRE REASON for gun control is to DISARM HONEST PEOPLE.